If you’ve seen an Alpha Show as part of an audience, or are just a fan of our shows, this is where you can write to the actors or characters from an Alpha Show, to tell us what you thought and get your questions answered. Our actors often check this forum for your messages and questions, so if you want a response, post your message in here. as part of our music program at school, we have been asked to research songs and discuss the contempary of the music and the mood and tempo it creates. I heard you used We Will Rock you in your pre show. Do you know who wrote the song and the title? We recently had Hercules tour through Whyalla, regional South Australia. I really enjoyed the show along with my year 4’s and 5’s. Thanks for such a great high energy performance. I just had an alpha show at Our Lady Of Lourdes Primary School Bayswster!! Loved it!!!!!!!!! Hey Josh!!! We’re so glad you loved the show! Sorry for the late response! See you again soon at your school! Have the Brisbane auditions already been? Sorry for late reply – but yes. You can come and audition later this year! I especially loved the one you did today, king Arthur! awesome I’m so glad you liked it! 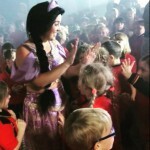 I absolutesy loved all the shows you’ve done at Romsey primary school when I was there! Thanks Rach! We worked REALLY hard on getting King Arthur to be that way this year. It first toured in 2009 and it was ok, 2010 was ok as was 2011, and we took a year off in 2012 to revamp it. I’m glad you liked it! How long did it take to practise?? Hello awaiting awesome-ers. ready for another year of Alpha! ?